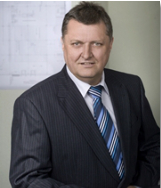 Rüdiger Metternich, metal and master smith, develops patents and utility models in the sectors of special purpose engineering, construction, transport and logistics which are deployed by major companies. I founded RMM as an engineering company for automated technologies in 1989. Due to visionary thinking, a lot of experience and practice-related profound knowledge my team and I developed innovative products, especially for commercial vehicle components and logistics and therefore, we are well-established in the market. My team of highly skilled staff goes hand in hand with working project-orientated. From theory at CAD workstations to prototyping, test series and TÜV (german technical supervisory association) certificates up to market launch. The results are innovative products which are distributed worldwide by RMM marketing partners. My motto is: A successful development requires a small idea which is brought to life by relevant expertise and especially by a high degree of passion.